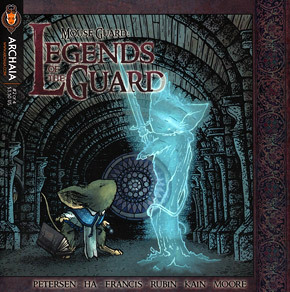 When the first issue of Mouse Guard by David Petersen was published in February 2006 it was clear to see that this was the start of something special, a very singular creation that would find an audience amongst fantasy fans and comic art aficionados. In a post-Harry Potter and Lord of the Rings media world heavily saturated with images of high fantasy, even the most vibrant of magical imagery seems commonplace. This is why a comic series that depicts colonies of intelligent mice struggling to survive in their dark (and often highly dangerous) medieval world feels so grounded and appealing. Published by Archaia, there have been to date two six issue mini-series with third (The Black Axe) set to debut in September 2010. A comic book title as tightly written and beautifully drawn as this (and all by a single creator) naturally takes a reasonable amount of time to produce. As admirers of this title includes many comics professionals, it is not surprising that other artists and writers would love to give their take on Petersen’s grand creation. This kind of collaboration is what makes Mouse Guard: Legends of the Guard such an appealingly lavish endeavor. Issue one of LOTG opens in the year 1154 in the June Alley Inn a place where both locals and travelers between the mouse territories gather for food and drink. The innkeeper, June, tired of the overdue bar tabs of her thirsty patrons, devises a contest to see who can spin the best tale with the winner newly free of their debt. The scenes at the inn (written and drawn by Petersen) become the bridging segments for the short tales that follow. 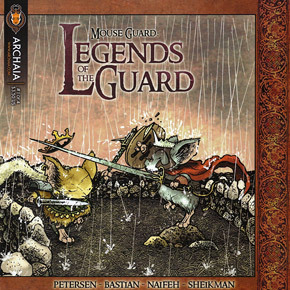 The first story of LOTG is then begins in an almost impossibly grand fashion with The Battle of the Hawk’s Mouse and the Fox’s Mouse by Jeremy Bastian. It depicts an earlier age when mice were protective servants to the larger creatures with whom they shared the lush European forests. Bastian’s meticulously rendered art and complex layouts are astonishing to behold (it was easy for me to name his own title, Cursed Pirate Girl, as the best comic of 2009). This seven page story may well contain the very best art you’ll see in any comic this year. A Bargain in the Dark by Ted (Courtney Crumrin) Naifeh follows in which a mouse aids an injured bat to the safety of his own kind. Normally sworn enemies, the two share this rare opportunity to learn more about the other. Issue #1 closes with Oleg the Wise by Scott (Terminal) Keating. Here brave King Oleg chooses to part with his faithful pet and steed, a white weasel, upon the grave advice of a mystic. This story actually hits quite an emotional chord as almost anyone reading can identify the heartbreak or loneliness felt after losing a beloved pet. The cover of issue #2 features another atmospheric, detail heavy wraparound cover by Petersen. Observant readers will discover that these images, which depict significant moments in mouse history, can be found in the inn segments as background paintings that adorn the tavern walls. The first tale of #2 is Potential with art by Sean Rubin and a story by Alex Kain. The extremely high quality of the art found in the prior issue is certainly on display again here via Rubin’s near obsessive line work and cross-hatching. Here we see how noble and brave the Guard are as a single member of their league is willing to fight a huge bear to protect a nearby mouse settlement. Next up is The Shrike and the Toad by acclaimed Strangers In Paradise creator Terry Moore. This particular story may be brief (2 pages), but goes a long way on charm as two mice, trapped in a field with a flock of predator birds overhead, use their ingenuity to get themselves out of a deadly situation. This second issue of LOTG wraps up with Worley & the Mink featuring a story by Lowell Francis and art by popular DC and Marvel artist Gene Ha. Here we meet Worley, a stubby banker who seems unremarkable on the surface, but is as fearless as any Guard member when it comes to reclaiming what’s his. The quest for his stolen money leads him to the lair of a viscious mink who has been raiding fringe mouse outposts of their goods. Here is where Ha’s art really shines. The pose of the creature, the details of his garb, and the blobs of ink flying through the air are so believably and dynamically rendered it brings the image near the realm of Photo-Realism. In contrast the forest background is very soft, almost Impressionistic, with warm, hazy sunlight filtering through the trees. This level of concept and execution is very telling of all the art you’ll find in the pages of LOTG. Perhaps the biggest accomplishment of this mini-series is that these short stories flesh out Petersen’s already highly detailed and history rich world. This makes the fantastical elements all the more real and believable to the reader, not unlike the great Inn at the World’s End story arc from Gaiman’s Sandman. Yes, this mini-series is that good. Stay tuned for a future installment of Sequential Sunday when we’ll take a look at the last half of this sterling title when the fourth and final issue hits the stands.